This shocking post will reveal a little known fact about dried cranberries. Someone has to reveal the truth! Cranberries are picked by fairies who live in teeny weeny mobile homes. Actually, the truth is not as interesting as the above fib. Dried cranberries, also know as “Craisins”, are not the same as raisins. Sure, Ocean Spray would like you to believe that they are the same, but there is one big difference. Dried cranberries are made with added sugar, while raisins are just dried grapes with no sugar added. Why should this matter to you? I guess I think that most of us put dried cranberries and dried grapes in the same category because they sit next to each other in the store and because of the name “Craisins”. Since Craisins has come out – Ocean Spray has added reduced sugar Craisins to address the level of added sugar. How much iron, potassium, protein, and calcium do dried cranberries have? None. There are no other significant sources of macronutrients on the package. You may be getting some micronutrients, if they survived the dehydrating process. The rest is just fiber and sugar (which they added). Raisins are more nutritious and fundamentally a different product (nothing added!) than dried cranberries. I'm not saying you should stop eating dried cranberries. I love to use them as a flavoring agent for salads or cookies, but be aware that raisins are better for you. Did you notice the difference between Craisins and raisins? What other dried fruits have surprised you? Reduced Sugar Craisins: Are These a Better Choice? I enjoy crazins on things like salads, but as a label reader I do see the amount of sugar and lack of anything else in them, and choose not to eat them as a snack. I love dried cranberries, but your right there mostly sugar! What other fruit that surprised me was banana's. You would think banana chips were healthy, nope!! Great post!! I couldn't agree more about the dried cranberries. Not a big raisin fan myself (give me the grapes before they dehydrate! ), but I would absolutely love dried cranberries without the sugar. Guess the only way to do that is to buy some fresh cranberries and a dehydrator.... do 'em myself! Our local grocery has some sweetened with pineapple juice instead of cane sugar and they are really yummy. I have no idea if that adds any food value. They also have some sweetened with apple juice. Good to know! I have an old bag of Trader Joe's raisins that list 29g sugar per serving ..... is 'added sugar' different? It's a shame they don't give people the option to buy just plain dried cranberries. It would be nice to add something tart to a salad, cookie, stuffing, etc. Don't think I have ever seen them without added sugar. If they do sell them let me know where I can get them. Will have to check out Target for their freezed dried section. Might be cheaper then Whole Foods. I like Craisins but I do limit them. On the other hand, I CRAVE raisins which is strange tome since I hated them until about 1 year ago! I buy them in the little boxes to keep some "control" After a long run, I love to make a wrap out of natural peanut butter, 1/2 a banana and one of those little boxes of raisins! Wow! Last night, while in the grocery store to buy dried Cranberries, I decided to read the label. I have to say I was so disappointed when I saw sugar as an ingredient. 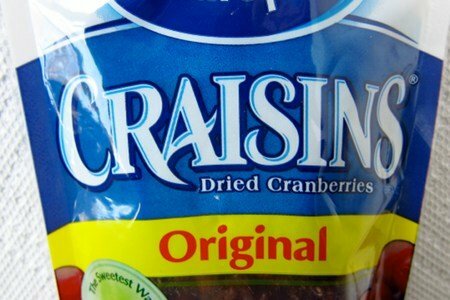 I've eaten Craisins for a long time always thinking I was eating just dried fruit. So crazy that you posted this today. I guess it is still ok to add to salad but now I know the "TRUTH" about them. Thanks for your wonderful posts. Always funny and informing! I've been buying my organic apple-sweetened cranberries at the bulk bin of my local health food grocer for years; the sugar content is the same but raisins beat out cranberries for potassium. Thanks for that awareness, SG! I was getting ready for some Fall baking using cranberries, pumpkin, and all kinds of nuts but now I'll add some raisins too! If you can't find fruit-sweetened cranberries, I've gotten Eden organic brand thru amazon. NNNNNOOOOO - Say it isn't true!!!!! Actually I did know this but love them anyways and I swear these little gems are what got me back eating salads. I am puzzled. While I accept that Wikipedia is by no means the last word in scientific fact, it provides a long list of nutrients purported to be present in cranberries. Also, our GP recommended my husband take a daily 1000mg capsule of cranberry extract to alleviate frequent bladder infections. These are now a thing of the past. Surely you are not suggesting that cranberries lack health benefits? I bought fresh cranberries and added them in my pumpkin bread over the weekend. They were not sweet and balanced the bread I think. I use currants when I need a change from raisins. They are labeled as my raisins, just dried currants. I keep some frozen for baking also. I will have to look up the nutritional info. Thanks for great info! Sunkist now makes craisins with 50% less sugar... just found them at Wal-Mart the other day. Also Whole Foods carries unsweetened dried cranberries... if I remember correctly they are in the bulk dried beans and fruit section- enjoy! I wondered the same thing as Renee, why there were ZERO nutrients at all besides fiber in the craisins? Are they somehow lost in the drying process or what? I found this out the hard way. I was adding dried cranberries to my oatmeal. Had a blood test done at the college where I work and my triglycerides were up. The nurse asked me if I was adding sugar to my morning routine. I said no, but when I came home I checked the cranberry package and gee, guess what I was adding? Needless, to say, I stopped eating cranberries. Cranberries have added sugar because they are naturally very low in sugar. If you compare raisins and dried sweetened cranberries they have practically the same amount of sugar -- 17 gms per ounce of raisins and 18 gms per ounce of dried cranberries. In addition, dried cranberries have 2 - 4 times the amount of antioxidants as raisins. They, along with blueberries and blackberries, are some of the highest sources of antioxidants around. If you eat one serving of cranberries, you've already exceeded the average daily antioxidant level of the average American diet. It's true that raisins have more potassium and iron than cranberries (the 1 ounce of protein is negligible). Both raisins and cranberries have their advantages. I think the reason you're seeing very little nutritional value in the Craisens is because (and I'll take his word for it, because I'd guess he knew) a local cranberry farmer said they are mainly the skins of the cranberries, left over from the juicing process, or some other process, whereby the "goodness" of the cranberry is used for something else - and this is just a cast-off (originally), that they are now marketing so as to get all the money they possibly can from the berry. I'm getting out my dehydrator. Who knew!? Thanks for the info. Glad you shared all the benefits on raisins, no I have a hankerin for some :).